TRIX is triple exponential moving average indicator. It could be used as oscillator and momentum indicator. Calculation of TRIX is based on EMA3 = triple exponential moving average (EMA of EMA of EMA). For EMA period is usually used value of 15. Generally, buying and selling signals could be created using zero line crossovers: buy signal when TRIX crosses above zero line and sell signal when TRIX crosses below zero line. 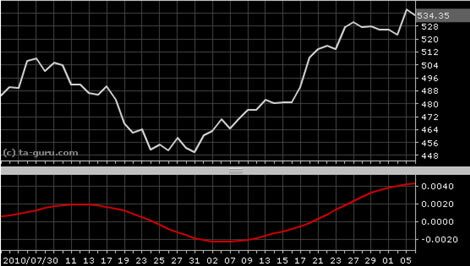 Many traders plot on chart signal line: 9-period moving average of TRIX, just like in MACD indicator. Buy signal is generated when TRIX crosses above signal line and sell when it crosses below signal line. Open chart for google with TRIX indicator.